Whether you choose to upgrade your ring, want to remove reminders of a broken relationship, or need to sell your engagement ring for any reason, the sales process can be confusing. Knowing where to sell your ring, how much to ask for it, and how best to prepare it for sale can take the mystery out of the process and help you get top dollar for your valuable jewelry. Before you get ready to sell your ring, it's essential that you make sure it's actually yours. In the case of a broken engagement, state laws disagree about who owns the ring. In some cases, the ring is considered the property of the person who received, but in others, it was a conditional gift and must be returned to the giver. This is also an issue in the case of divorce, where the ring may be the property of both parties. To find out about the legality of selling your ring, contact an attorney familiar with the specific laws of your state. There are many venues open to individuals and couples who want to sell an engagement ring. Each is suited to certain situations, so it's best to examine all your options before choosing the best one for you. Directly selling your ring to another person is your best chance to recoup as much of its value as possible, since there's no middleman to take a cut of your profits. However, you'll need to do the advertising work yourself. Newspaper classified ad: Your ad should feature a basic description of the ring, including the materials used, the carat size and quality of any diamonds, the condition of the ring, and any other descriptive information. Include the price you'd like for the ring and your contact information. Expect to pay a few dollars for the classified ad. Online classified ad: Websites like Craiglist allow you to place advertisements for free. You'll need to include similar information to what you would put in a print ad, but you can also include photos of your ring. Make sure you get pictures that show its condition and provide views from all angles. Online auction: You may want to sell your ring via an online auction site, such as a listing on ebay. You'll need to go through the process of setting up a sales account, writing a listing, photographing your piece, and keeping track of bids. However, this can be a great way to reach a national audience and get a good price. Ex-Boyfriend Jewelry - This site specializes in jewelry related to ended relationships, and in fact, you can only list the ring if you have a story about your ex to accompany it. Ads are just under two dollars and run for 90 days. OutofYourLife.com - To use this service, you send your ring to the site. They appraise your ring and offer you the lesser of $500 or a third of the ring's value. I Do Now I Don't - To sell on this site, you will need to create a free listing. When a buyer purchases the ring, the site holds the money until after the ring is authenticated by their gemologist and shipped to the buyer. The site keeps 15% of the sales price. Pawn shops also deal in unwanted engagement rings, and they can be one of the quickest and easiest ways to sell your jewelry. However, these shops are designed to make a profit, and they won't give you top dollar for your ring. To maximize the amount you get at a pawn shop, be sure you know your ring's value when you go in, and choose a shop with a good selection of jewelry. If you aren't happy with the price they offer, choose a different venue. Antique stores also deal in engagement rings, especially those that are from decades past. If you're considering selling to an antique store, be sure you choose one that specializes in vintage and antique jewelry. You can find many such shops listed on RubyLane.com. Expect to get less for your ring than you might if you were to sell it on your own. It's also important to find out whether the shop sells on consignment or if they'll simply buy the ring for their inventory. If the store sells on consignment, they may allow you to place the ring there for sale, but you won't receive any money for it until it sells. When it does sell, the store will take a percentage of the profits. If they will buy the ring from you, they will need to offer you a price that's well below retail. This is because they must take care of marketing the ring and need to be able to make a profit from selling it. Sometimes, if your ring is only a few days or weeks old, you may be able to return in to the jewelry store for a full refund. However, in most cases, you'll lose money selling your ring back to the place you bought it. Not all jewelry stores deal in pre-owned rings, so you'll need to inquire about whether selling at your favorite jeweler is even an option. If it is, they may offer to sell the ring on consignment, similar to an antique shop. Expect to pay a hefty percentage for the privilege of selling your ring there. To find a jeweler who will help you sell your ring, call around to the jewelry stores you trust. Your best bets will be independent jewelers, rather than chain stores. No matter which way you choose to sell your ring, it's important that you understand its value. This will help you set and receive a fair price. Start by getting a professional appraisal. 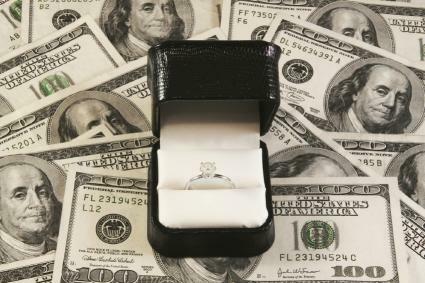 In addition to helping you find the value of your ring, this will give you credibility and help you get the most money. Examine websites and classified ads to see how similar rings are priced. Don't compare new rings, since used rings typically fetch far less money. Price your ring so it can compete with these other options. Often, this is about 60% of the ring's appraised value. A little extra work can dramatically increase a ring's sales price. Take some time to clean up the ring or have it professionally cleaned at a jewelry store. Include the original box if you have it. Have any repairs made to your ring before you list it for sale. Loose prongs, scratches, and other minor flaws can decrease the price you receive. Assemble any paperwork, including certificates and original sales receipts, to prove that you are hiding nothing about the ring's value or condition. If you will be selling the ring online, take quality photographs from several angles with enough magnification to show details. A photo of the ring's paperwork is also valuable. Be prepared for buyers' questions, both about the ring itself and about why it is being sold. While they do not need to know the details of the decision to sell the ring, letting them know it is because of a change in preferences or for financial reasons can assuage their hesitancy and superstition. Be clear with the buyer. Outline your conditions (if any) for returning the ring if it is not as they expected. If the ring will be shipped, be sure to insure the package. Selling an engagement ring can be emotionally challenging, but it doesn't have to be a practical challenge too. Understanding the process and your options can help you have a smooth sales transaction and get the most money you can for your jewelry.